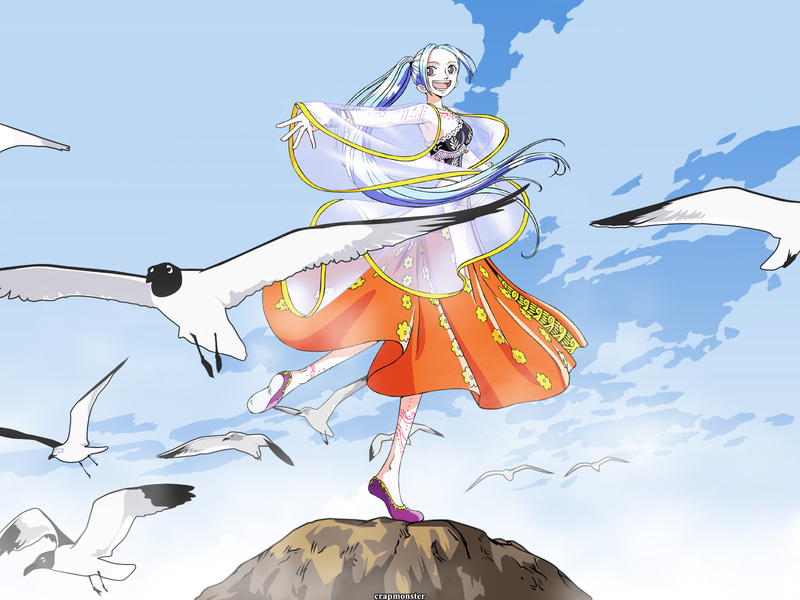 then i put in a hill, vectored some gulls and clouds in the back. Well, I don't know what she's doing standing on a rock out in the middle of nowhere, but it makes a really nice wallpaper. The sky looks great, I love how you made the clouds. The rock...err..."hill" looks good too...very "natural-looking." The scan is gorgeous. Crisp and clean...and shiny. Also, that's a very interesting choice for the scan...I don't think I've seen it before. But, then, I haven't spent any amount of time specifically looking through One Piece wallpapers, so what do I know? It's a very pretty scan, though. I like it. Saving the best for last, those seagulls are terrific. They are, quite possibly, the coolest gulls I have ever seen. Overall, a beautiful wallpaper. Thanks for letting us take a look at it. So Cool! I almost never saw a wall of Vivi in One Piece. Your skills for vectoring aren't need to be prove ;) It's great! I like the style of the gulls, simple and effective. And her, she's nice and clean, with all the details and even transparency. You can always find something to be improve, but I really like your wall has it is. Thanks a lot for sharing this and it's always nice to see a different style of wall from you! The vector is beautiful: especially like how you've done the transparency. & the gulls XD I love the gulls. Hm...it looks like she's dancing on a volcano. Interesting. go oppa for making another awesome wall! btw, that is awesome vectoring on the chara <333 luv the transparency as well. everything just fits in really well. i luv it. Another great vector of crapmonster :). You made wonderful vector and wallpaper :). vivi - chan :3 ! like it!..thx for sharing it! Great wall, thank you for this vivi wall! yay a vivi wall! she's sooo pretty here..